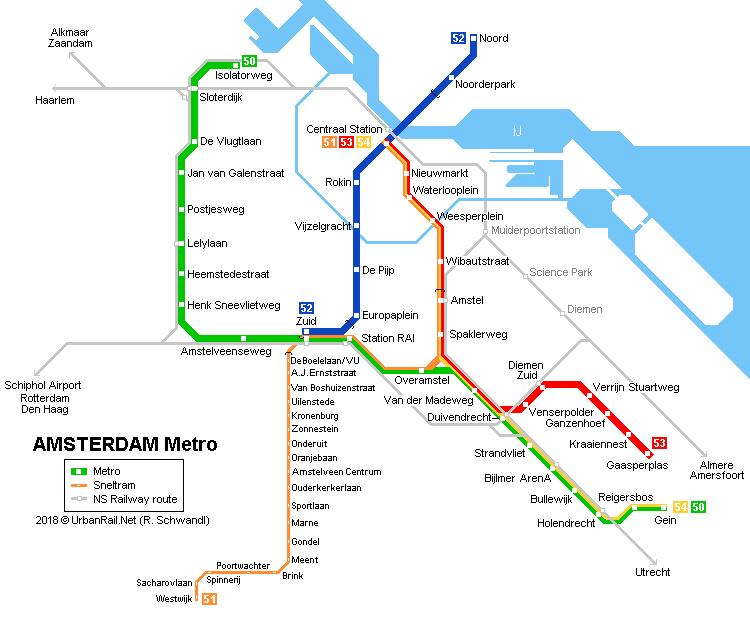 The Amsterdam Metro connects not only the region of Amsterdam, but also some of the municipalities outside of the city as Amstelveen, Diemen, and Ouder-Amstel. The metro is operated by the Gemeentelijk Vervoerbedrijf or GVB. Its length reaches 42.5 kilometers and provides 52 stations. The metro operates from 06:00 up until 00:00. Four main lines are operated by the metro: Eat Line (Routes 53 and 54), Amstelveen Line (Route 51), Ring Line (Route 50), and North-South Line (Route 52). Route 50 serves 20 stations providing a connection between Isolatorweg and Gein. Route 51 serves 29 stations providing a connection between Westwijk and Central Amsterdam. Route 53 serves 14 stations providing a connection between Gaasperplas and Central Amsterdam. Route 54 serves 8 stations operating at the Amsterdam North district. The OV-chipcard that might be used throughout the entire Amsterdam public transport system will allow to travel be my mean of transportation. Several types of tickets might be loaded on the card. A GVB season ticket offers unlimited travel on public transport. The fee for the monthly ticket is 91 euros and 61 euros by the reduced fee. The fee for the yearly ticket is 911 euros and 600 euros by the reduced fee. A GVB Zone Season ticket provides public transportation rides within the chosen zone. The fee for the monthly ticket is 46 euros and 30.50 euros by the reduced fee. The fee for the yearly ticket is 460 euros and 305 euros by the reduced fee. The daily ticket provides public transportation rides within the particular period of time. A one-day ticket fee is 7.50 euros, the ticket is valid for 24 hours. A two-day ticket fee is 12.50 euros, meanwhile, a three-day ticket fee is 17 euros. However, for children, the daily ticket price is only 2.50 euros. Children under 4 years are traveling free of charge. Children from 4 to 11 so as adults aged above 65 are entitled to discounts on the tickets.